It is the middle of a moonless night when the people of Birmingham are awakened by a scream coming from the streets. Someone has been murdered, they soon hear, but no body was found. Everyone gathers in the central square, looking for answers. They all rightfully know that the Bishop would have been the only person awake and outside at the time of the events. Disfigured in his early childhood by a disease that has affected thousands, he (like most of the few survivors) has never shown his face to anyone since then, became a monk to thank God for sparing his life, and usually comes out only at night time. When people come knocking at his door, he refuses to open as they would have expected. Instead, he speaks out the terrible truth that no one had been willing to see: "Someone from Worcester came during the night. Count the children." They soon confirm that one of the teenage boys is missing. A group of investigators is formed, and starts heading towards Worcester, accompanied by knights and diplomats. "One of my children has gone missing, and two knights including the one who was guarding him were found dead. Several of my people claim that a bishop from Birmingham is responsible for this crime." – "My Lord, we are terribly sorry to hear what happened here. Yet Birmingham has suffered the loss of a child as well, a teenage boy who was an expert in French, who cannot be found anywhere." – "Serves you right!" someone shouts from the crowd. "You struck first!" And as every face is turning to the corner where the voice came from, a child turns up and hands out a piece of paper to the Earl of Worcester. "Not everyone is who they claim they are", he says, and vanishes again into the crowd. What really happened during this dreadful night? Part of the answer requires completing the French sentence with one word, in French. Who struck first and how do you know that? Where are the boys now? The white knight was killed by the black pawn, which became a knight. The black knight was killed by the white pawn, which became a bishop. Another black knight killed the first white bishop. Birmingham=black and Worcester=white (for clarity, I will simply use "W" and "B". The light-squared bishop - that is, the trapped bishop on the c-file, hence the statement that he doesn't show his face and refuses to open the door - sees a visitor and knows someone is missing. Everyone assumes that since a boy is missing, a boy died. However, the knight died, and the boy became a knight. to find that W is on edge - everyone is guarding the children - and the town has apparently suffered three losses - a boy (the boy of whom it is said "he became" in French the hint hidden in the text, who became W's dark-squared Bishop), the knight guarding/behind that pawn dead, and another knight dead. Both of those knights actually died; however, the Bishop of W died and the missing child that killed the knight "became" the bishop of W.
The two B knights went raiding in W's territory, along with a young boy, killing one of their bishops and two knights. They was pursued into B by one of W's boys/pawns, who kills one. W's boy/pawn earns the title of knight for his deeds, which the public are obviously aware of, thus the "Serves you right". B's boy/pawn that participated in the raid decides to try to replace the knight that died in carrying out the raid. The French part is completed like so' "il est fou" - "he became crazy[normal use]/a bishop[in chess]." Credit to @Jerry for this part. If you're reading this, go give him an upvote, seriously. Great story from him and good find regarding "fou". The pawn became both crazy and a bishop - very clever, Mr. Mortier! Remember, the pawn replaces the bishop who is in mental shock from the disease and has strange habits like taking night walks. In order to imitate him, the boy became a crazy bishop - "fou." French punsters are pretty slick, it seems. Which is the French term used for the Bishop piece and which suggests promotion of a pawn to a Bishop, but which also means insane/crazy (i.e. the sentence can be translated as "He became insane/crazy". I'll use some fictional names which helped make things easier as well (dialogues mine, just trying to fit the mood of the events I imagined occurred). At nightfall, Ben left Worcester for Birmingham, followed by Smith and York. Seeing the three of them approach, Jule and Cain went to defend the city. While traversing the woods for a moment, the adults lost sight of the children they were accompanying. During that moment, the Jule managed to take both Smith and York by surprise and killed them. Cain soon arrived at the scene but Jule was long gone. In his stead, he found Ben arriving at the scene too. Ben lunged towards Cain who decided to retreat instead towards the city. Meanwhile, Jule reached Worcester where he got promoted to a knight and headed back towards Birmingham. Ben could not find Cain, in front of him was a tower, and to the right was a knight, Adam. "Your people have taken the lives of mine, now you will pay!" Jule arrived at that moment and found Ben cornering Adam, delivering the fatal blow. Ben at that moment got promoted to Bishop and decided the deaths of Smith and York were avenged retreated to Worcester. Jule however followed the bishop. Once there, Jule did not find Ben but found John and as he mistook him for Ben, executed him without losing any moment (they were both black tiled Bishops), before going back to Birmingham. At that point, Birmingham was waking up. The bishop of Birmingham was back to his living quarters, afraid that Ben was still there looking for him and refused to open the door when people came to him. When the people of the two cities meet, Ben was the one who shouted "Serves you right! You struck first!" And we know the remainder of the story from there. Some of the things can be directly translated to the chessboard, like the tower (Rook) being in front of Ben which I saw happen in Brandon_J's lichess study for instance. it never says the white pawn is dead. it's somehow still on the board. promotion, which also explains how the bishop on c1 got out! we have a problem. The white pawn has to promote on a dark square, which means it needs to promote on f8 or h8. However, the only piece that the white pawn to capture for it to promote there has to be the black g7-pawn. However, once it captures the pawn (after the g7-pawn captures the knight), it has to get past the f7 or h7-pawn, which I'm not sure how it can. The white Pawn moved forward from his starting position onto a black square, when the Bishop, on his nightly wanders, captured him. In retaliation the white Knight captured the missing black Pawn but left himself open for the Bishop to also capture him and then return to his starting position. 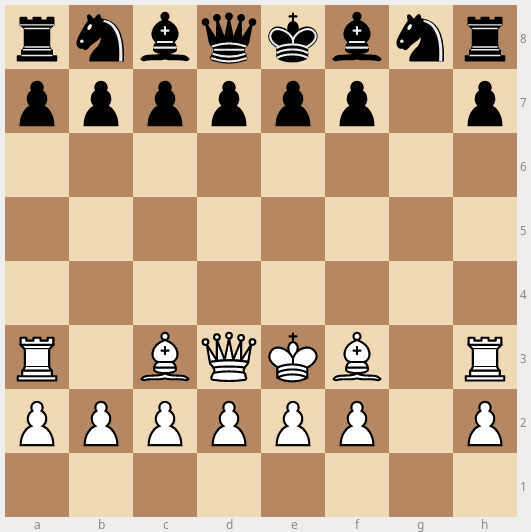 In the meantime the rest of the white non-pawn pieces used the gap of the captured Knight and Pawn to move forward and protect the other Pawns. The one white pawn does have to kill the black pawn to get his promotion (there's nothing else to kill, and he needs to promote on a black space) but the pawn doesn't have to be a pawn at the time. It can go promote and then come back. That would let the white pawn capture into the black space. Of course, there's a problem. The white pawn and the black pawn have to somehow get past each other to make that happen, without disturbing the other pawns. At minimum, that requires two kills of the same color. White's apparently lost both knights - apparently a very recent edit. The white pawn and black pawn advance. Black pawn gets around white pawn by killing both knights, and promotes to queen. Black bishop moves out of the way, the newly promoted black pawn moves into his position, and is killed by the white pawn, promoting him to bishop, whereupon he comes back. Someone kills the old bishop, and white trundles the rest of his people out and into place. Not the answer you're looking for? Browse other questions tagged story chess or ask your own question.